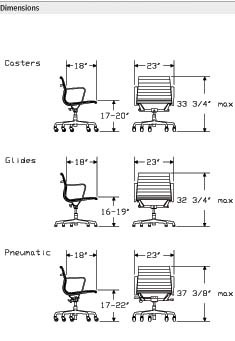 Eames Aluminum Soft Pad Group Office Task Desk Chairs by Herman Miller. 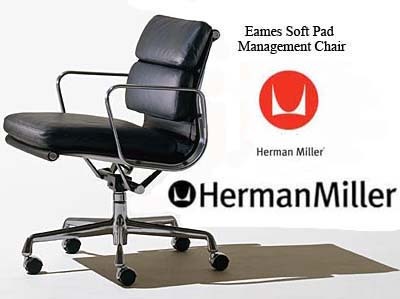 WE ARE A HERMAN MILLER AUTHORIZED DEALER & SERVICE REPAIR CENTER! Eames Chairs can only be shipped within the U.S.A. It's uncanny. A chair designed in 1958 as outdoor seating still manages to look both classic and contemporary in 21st century interiors. The chairs' clean, trim lines make them appropriate for all kinds of places, from classic and contemporary homes to elegant offices to hip startups. Individually upholstered cushions. 2 3/4 inches thick. Brightly polished aluminum. Arms, frames, and bases. Executive and management models have seat-height and tilt-swivel adjustments. Never ones to favor style over substance, Charles and Ray Eames gave this chair an innovative suspension that creates a firm, flexible "sitting pocket" that conforms subtly to the body's shape. They created that suspension by stretching a continuous piece of seat-back upholstery tautly between lightweight aluminum side ribs. 2-3/4-inch-thick foam cushions make for comfortable sitting. Pneumatic lift and tilt lock are available as options on the management and executive models. Charles and Ray Eames developed the Eames Soft Pad chair in 1969 as a luxury version of their Eames Aluminum Group chairs. Introduced in 1958, the Aluminum Group was a special project by Charles and Ray Eames for a private residence being designed by Eero Saarinen and Alexander Girard for Cummins Engines founder J. Irwin Miller in Columbus, Indiana. At the time, the furniture was called the "leisure group," or "indoor-outdoor group" since it was meant to address the lack of quality outdoor furniture on the market. Herman Miller began making the Aluminum Group chairs in 1958, and they have been in continuous demand ever since.